An unusual staffing structure, poor communication and an interagency rivalry led a group of firefighters to get trapped and burned while fighting the Mendocino Complex Fire in August 2018, according to a new report out from the U.S. Forest Service, Cal Fire and the Los Angeles Fire Department. Six firefighters — one from Cal Fire and the others from the LAFD — were performing firing operations, burning vegetation between the fire and a dozer line, on Aug. 19, 2018. But many of them were confused about what exactly their task was and who was in charge. They were also unfamiliar with the part of the fire they were battling and were concerned that they couldn't identify escape routes if things went south. Several firefighters involved thought, "What are we doing? Why are we burning?" according to the report. The "bad feeling" they had about their assignment turned to reality as the fire jumped the dozer line and came toward them. "Conditions changed rapidly as a crown fire exploded around them," according to the report. "Trees ignited instantaneously from the bottom to 100-foot flame lengths stretching off the tops. It went from daylight to pitch black night instantly. Embers and ash swirled around them. The roar of the fire silenced everything." One firefighter surveyed the scene and thought, "Man this is where we are going to die. This is how it ends. We are going to be vaporized." 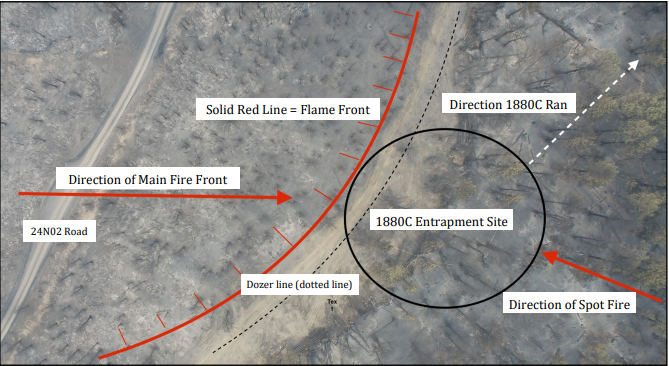 An illustration from the report of the site where the six firefighters were trapped on Aug. 19, 2018, during the Mendocino Complex Fire. At the time, the group was unable to communicate with other firefighters or incident command. The firefighters dropped their tools and ran through unburned vegetation away from the fire. One firefighter tripped over a debris pile, and supplies fell out of his pack. "He had no idea where anyone was but ash was raining down," the report said. "He felt the heat of the fire on his back, jumped up, ran a few more steps, and fell again. He scrambled up again and kept running." The group eventually made it to a road and was picked up by other firefighters. They all suffered burn injuries, and two had to be hospitalized. At this time, the Mendocino Complex Fire was already the largest in modern California history. But it was still competing for resources with several other large fires burning throughout the state, including the Carr and Ferguson fires. A lack of resources on the Mendocino Complex pushed fire officials to make the unusual decision of combining a Cal Fire incident management team and a Forest Service incident management team. But working together did not always go smoothly, according to the report. Several positions were duplicated, and there was confusion about who was in charge. "The Cal Fire-Fed rivalry was evident on this fire and I believe it was a detriment to the operational tempo and production," one firefighter told investigators. That strained relationship between the two agencies comes from two opposing firefighting strategies, says retired Forest Service firefighter Mike Beasley, who worked on the Mendocino Complex for a few days doing fire modeling. "The feds are willing to do what's called modified suppression where they use natural barriers and let the fire burn," Beasley said. 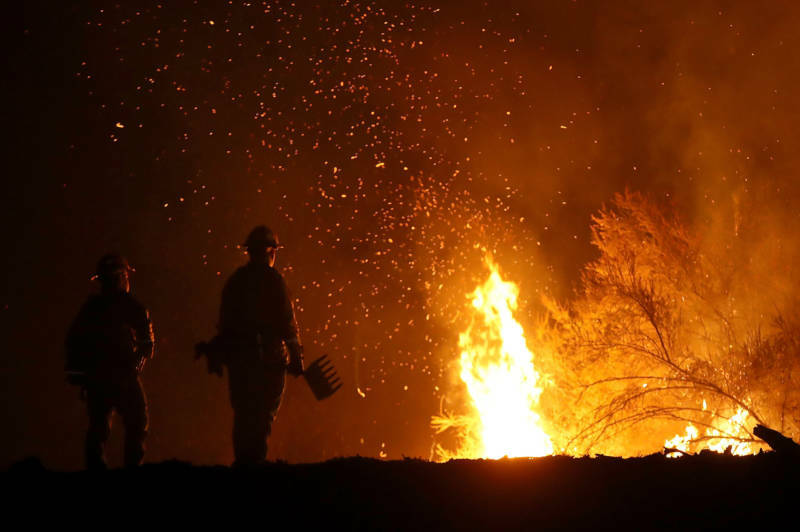 "And Cal Fire, it's not their temperament to manage fire that way. They hit it hard, and they hit it with everything they have." The report notes that a less aggressive approach, which would've allowed the fire to burn an additional 100,000 acres, was proposed and dismissed because "the [incident commanders] felt the Agency Administrators didn't want more acres, more smoke, more communities involved, or more forest burnt." Cal Fire declined to comment. A spokesman said the agency, which helped compile the report, hadn't had a chance to review it yet. The LAFD and the Forest Service both did not respond to a request for comment.